Evolved to meet the demands of today's cruising yachtsman, the T54 is well suited to both coastal and long distance sailing. This yacht, designed by Bill Dixon has a modern designed hull and the long waterline length and sleek coachroof lines provide for fast comfortable sailing and long distance passage making, easily handled by two persons when all the controls are led back to the cockpit. 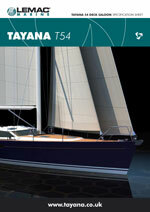 The T54 cruising centre cockpit yacht will be a welcome addition to an already outstanding range. 2- Two-speed #64CEST Genoa (primary) winches. 2- Two-speed #40CST seconary winches. 1-Two-speed #48CEST main sheet & stay sheet winch. 1-Two-speed #44CST main outhaul & halyard winch. Stainless Steel water tanks, total of approx. 200 gallons. Manual & DC engine space bilge pumps.